This is it folks! We only have two more farmers markets this season. This Saturday and December 16 stock up on local food while you can buy it directly from local farmers at the market. Once you bring the winter harvest home, it is helpful to know how to store crops for longer shelf life. Here are some helpful storage tips for produce you can find in abundance at market this Saturday. Beets: Cut off the tops; eat these up like chard. They are delicious cooked or even cut really finely into a salad. Store your beets in an open bowl with a damp towel over the top. You can also put them in a cool place in a box with sand or dirt as a cover. Don't refrigerate. Carrots: Cut the tops off. Store in a cool place (the refrigerator crisper drawer or lowest shelf) in an open container or in a perforated plastic bag. You can perforate a plastic bag by sticking it with a pin. This small amount of air circulation helps keep carrots moist and crisp. Another option is to wrap them in a damp towel. Celeriac: Wrap individual roots in a damp towel. Store in your crisper drawer in the fridge. Garlic: Garlic can be stored in bowls or baskets on the counter. Check stored garlic regularly for any mushiness or signs of sprouting. Onions: Onions need good air circulation. Store them in a mesh produce bag or basket. Hang them if at all possible. Parsnips: Remove the greens and store wrapped in a damp towel or perforated bag in the crisper drawer. Potatoes: Store potatoes in a cool dark place; your basement may be a good option as long as it's not too damp. They can be stored in baskets, bowls, a box with dirt or sand, or even in a paper bag. Avoid storing potatoes too close to onions or in direct sunlight. Onions make potatoes go bad more quickly. Turnips: Remove the greens and store turnips in a container covered with a damp cloth. Best stored in the refrigerator crisper or lowest shelf. Leafy greens: Store in a plastic bag in the crisper drawer or lowest shelf of your refrigerator. Local farmers also have bulk meat, cheese, artisan cider, and more delicious food for your holiday table at market. Shop local and eat seasonal this winter. Midori Farm will have two kinds of beautiful, delicious dry beans for sale, as well as our favorite Dakota Black Popcorn, which is the most flavorful popcorn we know. Come take advantage of our 5 for 45.00 sale on all varieties of our farm-grown kraut and kimchi, it's a great deal. All of these make great gifts! We will also have our usual array of fresh winter veggies of all kinds. Onatrue Farm is done vending for the season. Farmer Max has one more radiation treatment. He writes, "I am physically diminished, not a muscle on me, being outside is like being on the moon." Max and his family are taking the remainder of the market season and winter to recover. He plans to sell his mushrooms and other produce at Chimacum Corner Farmstand this winter. Max writes, "Thanks for everything. I fully intend to be at the opening market in spring with lots of goodies. Be well and happy holidays. -Max"
On sale this week at One Straw Ranch are the raw ingredients for some old fashioned tasty wholesomeness. We have beef, pork, and lamb bones for making nutritious bone broth; pork leaf lard to render into pastry lard for divine pie crusts and biscuits; beef suet to render into tallow for cooking, wild bird suet cakes, or a moisturizing skin balm; and pork back fat to render into all-purpose cooking lard or wild bird treats. It is very simple and economical to render your own lard or tallow or make your own bone broth. And it’s very fun to make your own wild bird feeders! Recipes will be available at our booth. At 50% off, now’s the time to give some of these ideas a try. If you want a large quantity of something, contact us ahead of time so we can come adequately stocked: charlotte@onestrawranch.com or 360-531-0404. This is our last market of the season– we’re sorry to miss next week’s closing market! So, this weekend take the opportunity to put a few packages of meat in the freezer or sign up for the Winter Delivery email list. Thank you for a great market season! Red Dog Farm’s Stock-up Special continues this week and next! Spend $40 or more and get 20% off. We have tons of winter squash, carrots, potatoes, roots, kales and other greens. Thanks for stocking up locally and supporting us farmers, we greatly appreciate it! Nonprofit partner, Swan School, will be at our last two farmers markets of the season selling their Plantathon cards. These cards offer a great alternative gift for friends and family. The purchase of each card goes to support Swan School students in planting trees in support of salmon habitat. Visit the Swan School market booth for more information. 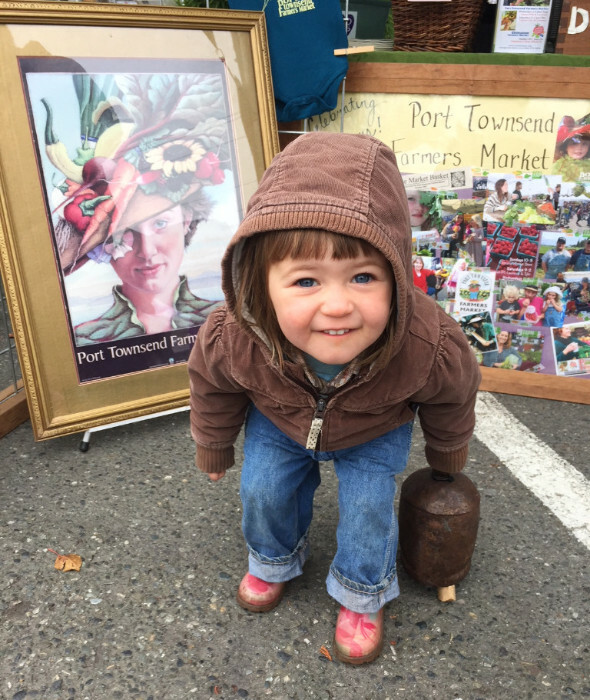 Saturday, December 9th, Port Townsend Farmers Market, 10 am-2 pm, Tyler Street. The New Old Time Chautauqua will parade through the market at around noon in promotion of their annual benefit show, The Jugglers Ball. This year’s show features many of the funniest, most skilled, show-stopping, and famous jugglers in the Pacific Northwest. All proceeds for the show will go to support the New Old Time Chautauqua for their exciting upcoming 2018 Washington State Parks Tour and collaboration with the Confederate Tribes of the Colville Reservation. Learn more about the show and purchase tickets at: https://jugglersball.brownpapertickets.com. Saturday, December 16th, 10 am- 2 pm, Holiday Farmers Market and Season Closing, Tyler Street and inside the Port Townsend Community Center. Shop inside for local arts and crafts, fresh food for your winter celebrations, arts, crafts, and more! Also, live music by Aimée Ringle, Gretchen Sleicher and friends.